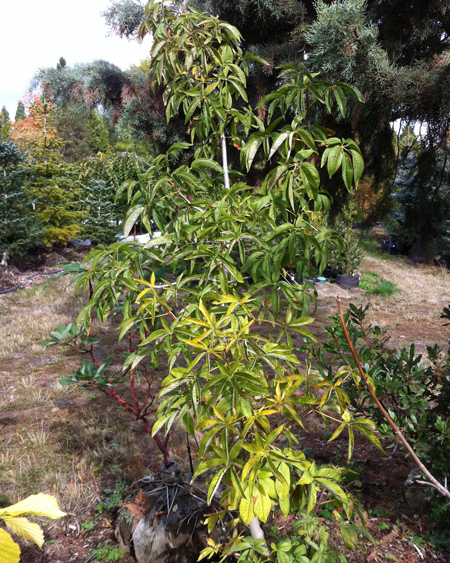 The California Buckeye is an attractive small tree with excellent drought resistant qualities. This is a great plant for a sunny hillside where its attractive form can be enjoyed. It would be interesting planted with or near some of the Sumacs. While it survives with little water, it is more attractive if supplemental water is given. Thus, it can be enjoyed in a mixed border of lower-growing plants, toning down harsh colors, or as a specimen. A multi-stemmed, spreading tree, this western native grows ten to twenty feet tall with a nearly equal spread. Fragrant, creamy flower plumes in April and May, make it look like a giant candelabrum. Seed pods are good for dried arrangements. It has an interesting form after leaf drop. Large winter buds are sticky. Blossoms attract hummingbirds. Relatively drought tolerant, it may lose its leaves as early as August in dry years. Categories: All Plants, Deciduous, Native Plants, More..